It’s no secret that I love eating out. Fast food, family cafes, fine restaurants – I love them all. But now that we have three growing boys, it’s gotten a bit pricier to take everyone out to eat. And leaving them at home with a babysitter isn’t always an option. Find places where kids eat free or cheap. There are many restaurants that allow kids to eat free from the kids’ menu with the purchase of a regular entree. And others offer 99 cent meal options on certain days of the week. Check out My Kids Eat Free to find offers in your area, or simply call your favorite restaurants and ask if they offer any discounts for kids. Look for coupons or special offers. Check the websites of your favorite restaurants for special promotions or coupons. Look in your local newspaper for coupons. See if any community groups sell coupon books or saver cards as a fundraiser. Visit the Facebook pages of your favorite eating establishments. Check out sites like Groupon, Living Social and Restaurant.com for 50% to 80% savings at local restaurants. Just make sure you read the fine print of each offer closely, so you won’t have any surprises when it’s time to pay. The lunch menu is almost always cheaper than the regular dinner menu, and service is usually quicker. Choose to go out for breakfast and save even more. If you’ve got picky eaters or kids with surprisingly big appetites, consider going to a restaurant that has a buffet. My boys enjoy having lots of options to pick from, and I like that they can eat as much as they want without costing a fortune. Beverages like milk, juice, and soda (or pop, as we say in Minnesota!) can really jack up your restaurant bill. Stick to water instead. If your kids are really little, you can probably get away with bringing in sippy cups from home at some restaurants. Some restaurants offer things like free chips and salsa or popcorn while you’re waiting for your meal. When these are offered, it’s easy to skip the expensive appetizers and you may even be able to order smaller, less expensive portions for the kids if they’ve already filled up on the free stuff. And some restaurants offer deals like unlimited bread or free refills, so be sure to take advantage of those. You may also be able to get your entire meal for free by investing a little bit of time. You can earn free gift cards to your favorite restaurants through Swagbucks that can make your dining experience much more affordable. Stick to the tried and true. Make sure your child orders things they’ve enjoyed before. If they want to try something new, let them sample something from your plate, or make sure that whatever new thing they’re trying is paired with something you know they like. The only thing worse than having a hungry and upset child because they don’t like their meal is having to pay for that meal. Most parents head straight to the kids menu when ordering for their children. But sometimes it can be more affordable to have two little ones split an adult-size entree instead. If you have very small children who eat like birds, consider feeding them before you go, and sharing whatever you order. You’ll save money and you’ll have built in portion control! Restaurant desserts are amazing. They’re also really expensive. You could easily spend $20 or more just on desserts. Instead, have a homemade treat or some ice cream at home for a fraction of the price. If you really want to splurge on dessert at a restaurant, get one big dessert you can all share. 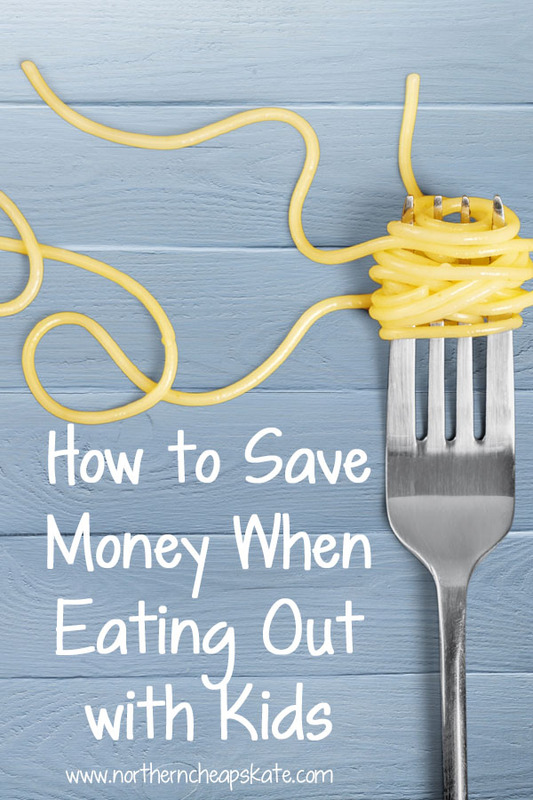 You’ll save money, and be kinder to your waistline, too! Make the experience worth the money. Plan your dinner out so that the kids are well-rested, but not hyperactive. Too-tired or Too-wild children don’t make good dining companions. Try to head to the restaurant when it’s not as busy. The wait to be seated and served will be shorter, and there will be less crowds and noise to upset your children. Bring something for the kids to do. Never assume that a restaurant will provide your child with something to do. When my kids were small, I kept a small packet of crayons and a little notepad in my purse so the kids to draw while we wait. We also allowed our boys to bring a small toy (like a Hot Wheels car) with them. My phone was loaded with kid-friendly apps and videos to keep them occupied until the food arrives. Of course, playing games of “I Spy,” or taking the kids to wash their hands before dinner are also useful ways to kill time while waiting. I also recommend ordering food (for both you and your little ones) that is easy to eat. Things that have to be cut (like steak) or assembled (like fajitas) are probably best left for at home or childless dinners out. Make sure your kids understand what kind of behavior your expect at the restaurant and what consequences there are for inappropriate restaurant behavior. Teach your children manners and how to sit at your dinner table, and everyone will enjoy the experience that much more. Be sure to thank your children for good behavior at the restaurant. Tell them specifically what behaviors you appreciated. Reward your child with special treats like a low-cost dessert at home, a later bedtime or a stop at the library to check out a new book. Eating out with kids doesn’t have to be expensive or a chore. With a little planning, it can be an affordable and enjoyable experience. My daughter and I used to love going to the local Chinese Restaurant buffet. The charge for kids under 12 was small for both lunch and dinner. It turned out far less expensive than ordering off a menu, and we could both try things we might not otherwise order. Better still, my wife didn’t care for it, so it was quality father/daughter time at a bargain price.